Joseph Goebbels said, "If you tell a lie big enough and keep repeating it, people will eventually come to believe it." While I realize that Goebbels was Hitler's Propaganda Minister, in no way am I comparing Trump's campaign to Hitler. Such comparisons are over-the-top nonsense. Trump is not Hitler. I only refer to Goebbels' quote because it is the disingenuous tactic Trump has used against Ted Cruz. Trump has relentlessly repeated his outrageous "huge" lies that Cruz is a cheater, liar, and Washington DC insider. Folks, nothing could be further from the truth. And yet sadly, Trump's unfounded lies have taken root in the minds of some voters. Cruz did his homework, thoroughly studied the delegate rules. He "legally" maximized his opportunities to win delegates. 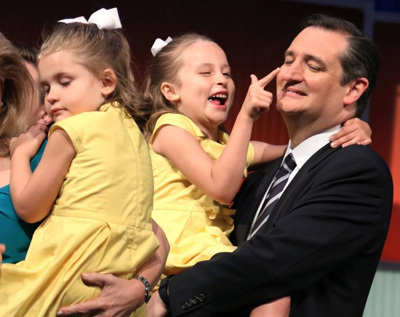 Cruz's approach to securing delegates proves his presidential executive qualifications – his instincts to dive into an issue, study it inside and out, and implement the most effective strategy. Cruz's political history shows that, as president, he will apply the same laser-focus to tackling issues – implementing wise and informed solutions most beneficial to We the American people. Amazingly, Trump has gotten away with his huge lie that Cruz is a cheater, despite Trump benefiting from the same delegate rules as Cruz. Trump's Cruz-is-a-liar huge lie is so unfounded that it can only resonate with the clueless. Please produce evidence of what Cruz has lied about. Trumps' hugest lie about Cruz is that he is a Washington DC insider. The truth is, Cruz's entire political career documents that he is the epitome of the ultimate Washington DC outsider. Again, I respectfully say Trump's huge lie only works with the clueless. As for Trump's Cruz-is-a-politics-as-usual-DC-insider lie, Mr. Trump cannot have it both ways. Remember when Trump said both parties in Washington hate Cruz – citing Cruz's outsider status as a negative that makes him unable to make deals? Cruz has been vilified by both parties for faithfully fighting to implement GOP broken promises such as stopping Obama's unlawful amnesty for illegals. Talk about cojones, Cruz infuriated the mainstream media and both parties when he shined the light of truth on DC insider corruption, calling it the "Washington cartel." The truth is DC insiders despise Cruz for being a strong and formidable warrior, committed to keeping his word to voters who sent him to Washington. Now Trump is trying to convince voters that Cruz is a homey of DC insiders. Hogwash! In reality, Trump is the one who is a DC insider, hiring lobbyists and paying politicians for decades. Trump admits being friendly and ready to make deals with extreme partisan Democrats. There is a huge elephant-size character flaw on display in the Trump campaign's living room. Trump's willingness to throw grenades of blatantly unfounded huge lies about Cruz and Trump's constant shifting of his positions from conservative to liberal, then back to conservative, are causes for great concern. This man will say whatever he believes necessary to win. Thus, it is not unreasonable to question Trump's trustworthiness. Folks, rather than instantly believing Trump's huge lies about Cruz, please do a little research. As they said on a popular TV show, "The truth is out there."